Gevrey-Chambertin is the home of the most modern, international-styled Burgundies. Dark colours, big, bold tannins, high alcohol levels, usually a lot of new oak too. If you like your Burgundy to taste like some Californian woody syrup, you could do worse than buy yourself a Gevery-Chambertin. Not from Frederic Esmonin, though! He is one of the last hold-outs against the trend in Gevrey. You would never mistake, say, a Fourrier wine for one of his. Where the trend is for big tannins, his are soft; there’s never excessive alcohol or powerful fruit. They are quite, quite beautiful. And, if I may quote my chum Tom, they are Burgundies that will age ‘forever’. 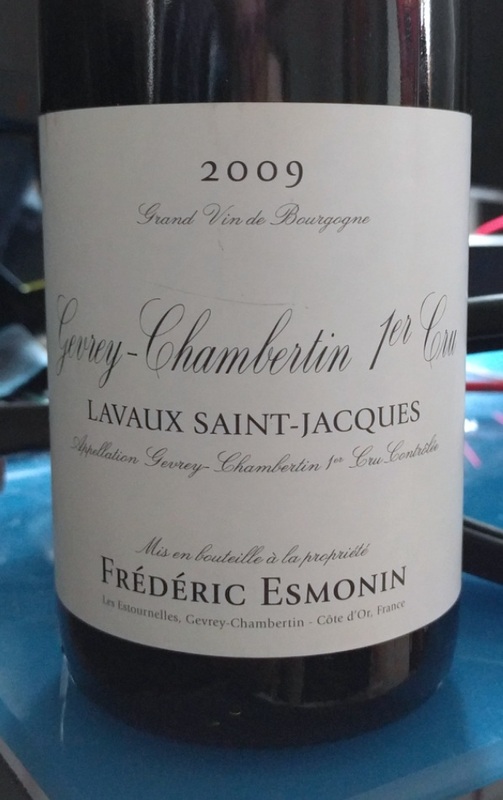 Almost every other 2009 Burgundy is a stew of high alcohol and ripe, big fruit. Not this! It is a minimalist expression of pure beauty. Yes, there is fruit there – it is not short of it by any means – but it is gently ripe and soft; an understated model of sculpted prettiness. ‘Pretty’ is usually damning a wine with faint praise, but with this little lovely it is a wonderful expression of its winsome charm. If I had not drank an awful lot of Esmonin wines I would be surprised that a 2009 could have such a small scale nose of pretty fruit and creamy earthiness. This is his way and long may it continue! There is no denying that the fruit and earth on the nose is an intricate model of refined complexity, but it just oozes ‘drink me, big boy’-charm and personability. The palate is also a small scale construction of loveliness. There is quite impressive acidity for the vintage wound up in involute scrumptiousness with a delicate tannic structure. The fruit is also incredibly pulchritudenous on the palate, and is neither too powerful nor too light for the tannins and acidity. Harmony and minimalist pleasure are what this palate is about and that makes it extraordinarily attractive. I think The Editor and I caught this at a deliciously beautiful stage in its evolution, but I really do think it is wines of this lightness and understated scale that my friend Tom is on safest ground saying Burgundy can age forever. Those big, tannic, powerfully fruity, woody, alcoholic beasts may have ‘balance’ in the sense that they have a lot of everything, but it is beautiful balance of wines like this Esmonin that repay any length of time in the cellar that you can manage to keep your mitts off them. This is truly a great wine, but truly I doubt that when most bastards taste this they will not see its small scale stylishness as such. It sounds extremely delicious, David. A few weeks ago I drank some absolutely terrific 98 and 99 grands crus from here. I’m sure that things have got even better here since then but I think the principal truth is that many have grossly underrated this domaine simply because of their modest prices and unshowy winemaking. I am finding myself increasingly thinking that I enjoy top 1ers such as this and their brilliant Estournelles even more than many grands crus. I examine myself rigorously to check that this evolving preference is not simply born of financial necessity, but actually I enjoy a bit less volume and some slightly more visible edges at least as much as cushioned plumpness. As one who has shared your general reaction to 09 I have found recently that the excessive fruit compote of the vintage has receded, fortunately.. Indeed, I think they are massively underrated. They may not be flash but they are utterly lovely, really a style of Burgundy that tickles my.fancy. I haven’t had any Grand Cru wines from them in a few years, but the Premier Cru wines, as you say, really jabbed an attractive little hint of a bite to them that keeps you keen. Great stuff!